I'm not a Valentine's day girl at all. In fact I'm not crazy about any date in the year, be it my own birthday. There have been times I have forgotten my own birthday. For most of the important days in my life, I really like low key celebrations. A simple day at home, with some good home cooked meal and good dessert. That's what I call perfect! Once that's done, I'm running around to get the dishes cleaned, doing university assignments and sometimes attending classes or catching up with office work (and tweeting and reading blogs). And midnight when I can't take no more I hit the bed (still tweeting). So for me personally, any day that I can be home not "running around" (tweeting and reading blogs) and have some chocolate dessert to eat is Valentine's day not particularly 14th February. Since February is also the month Kuwait celebrates its National day and Liberation day, we get quiet a few holidays and that's when I find my Valentine's day! But I know many of you celebrate it and if I can find a way to bring this to you, I don't mind calling it Valentine's day dessert. There's something so soothing and relaxing about chocolate, I can't emphasize it enough. And when its hot, I'm transported to heaven. This molten chocolate cake with do just that. 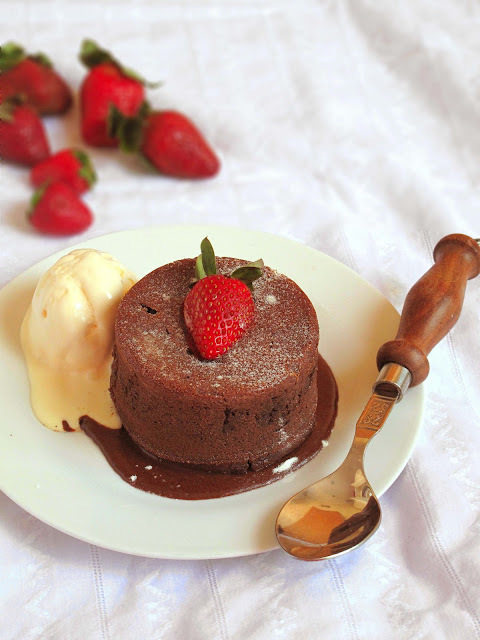 I had always eyed molten cakes by Paula Deen and The Pioneer Woman but it was not until my sweetest friend Prerna from Indian simmer (a gorgeous blog) posted this cake from Foodista that I really tried it. She is also celebrating her first anniversary this month, so this is for your Prerna. Lots of love and chocolate your way. Serves 6 or 3. Really it depends on who is eating it. * We like our chocolate really dark. Depending on which chocolate you are using you might want to adjust the sugar. I suggest you start with 1 cup sugar and take your way up from there. The best way is to taste it before you mix the flour. ** I have tried this with 1/3 cup orange juice as well and we love that variation. The taste would be quite subtle but if you love chocolate and orange together, it sure will win you over. Preheat the oven to 220 C and butter the ramekins. I used 3 1/2 inch ramekins making 3 servings. If you want you can make smaller servings by using smaller ramekins, but remember its valentine's day. And indulgence is a good thing. Once it cools down whip in the eggs and coffee. Then add the flour and salt. Divide the batter into ramekins. The original recipe calls for refrigerating the batter for 1 hour before baking but I didn't bother with it. Bake for 13 minutes until the center is still gooey but the edges have slightly firmed. Run a knife over the edges and invert into dishes. CONGRATULATIONS!!! and your photographs are getting better and better. A stunning post Kulsum and sending you wishes and hugs for many more to come. Kulsum, I love this! Who doesn't love chocolate? Irresistible! 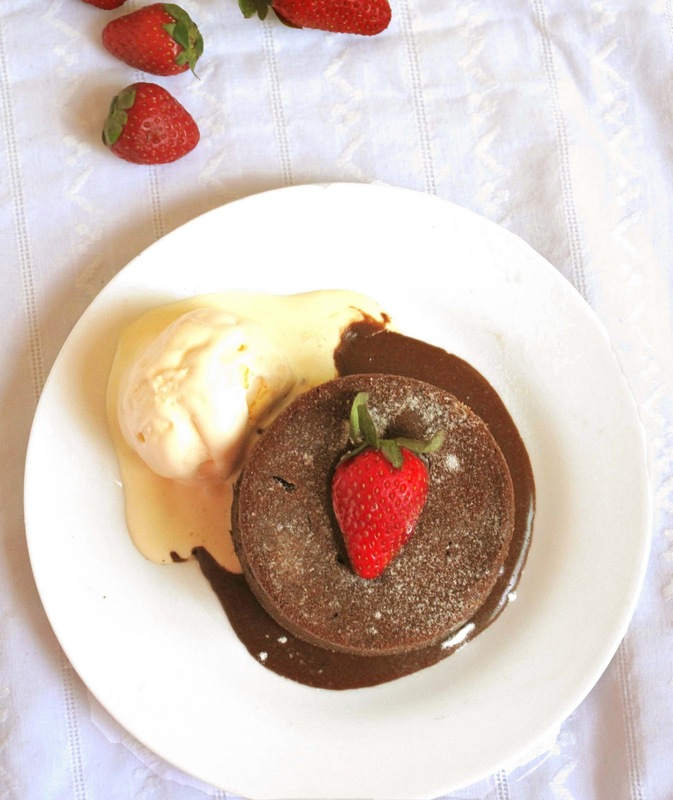 I love molten cake...but you know that already! Looking good Kulsum! Our recipes are just very slightly different- I had great difficulty taking photos of mine because the ice cream kept melting! I love molten chocolate cake, it's a classic that you can never tire of! I my laughing at the opening line of your post!! You knw the other day I was taking pics wearing pink PJs and later saw that all spoon pics have a pink reflection...still a lot to learn in taking pics. I had a similar crazy life style back in India..Lived my life only on weekends and I know once I start full time here..it will be the same..but like you ..I love it when I have lots of work around and in mind.I m not a BIG chocolate person but I wanna try this cake for the sheer joy of baking it to see if I can get it right.neat like yours...I always scared of inverting cakes..you have done it so beautifully even with ice cream intact!! Kudos! Oh I always go for this type of cake when we go out. Just something about all that warm luscious gooey chocolate bursting forth...impossible to resist. Yours looks great! Such a decadent perfect looking cake, this is just the right kind of chocolaty dessert for Valentine's day! That looks wonderful, perfect chocolate goodness! ha! :-) I guess it was the way the tweet was worded that misled me :-D That is why I was wondering why there was no mention in the post and I read it twice when i could not find anything the first time.. LOL sorry about that. looks yum- i planned to make this around v-day ! after seeing ur pic can't wait to make them ! This looks absolutely delicious! I may need to make it for Valentine's day. The lava cake looks really decadent Kulsum. Any day that I can enjoy a dessert like that is worth celebrating, I cannot be limited to just a few such days in a year :) Your photographs are stunning. I was laughing when I read this, all that running around tweeting and reading blogs all day sounds familiar. 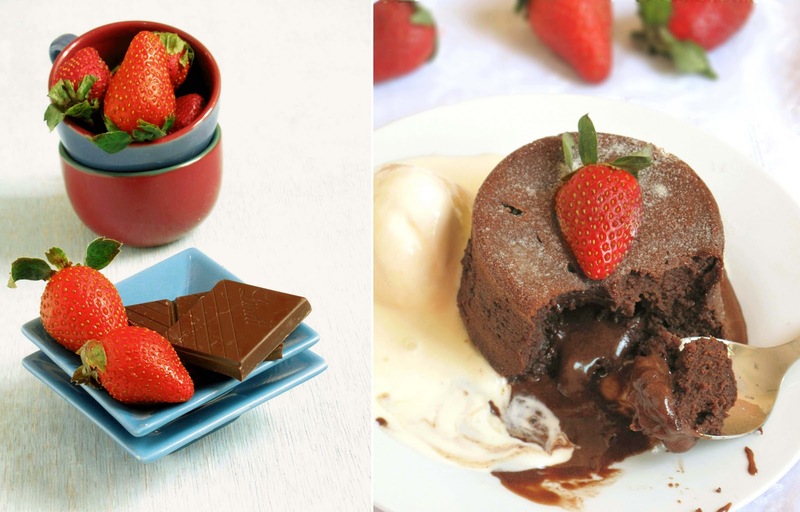 Fantastic recipe for Valentine's day - lots of chocolate + not too much effort! I made the same cake recently!! Love it! Love that I can see your whole room in the spoon.... What a great post Kulsum & gorgeous pictures! The little cakes have my name on them; chocolate paired with strawberries? Yes..doesn't get better than that! Kulsum, that cake is absolutely fantastic. I was just thinking of the items to prepare for the Vday party and picked the main course form Tanvi's blog and now I decided on the dessert. That looks absolutely delicious and hubby is a big fan of anything chocolate. I am in love with your pictures, btw. A gorgeous Valentine's Day dessert! A terrific chocolate treat. Lovely post, Kulsum. I am not a big fan of the Hallmark holidays either but LOVE celebrating birthdays and anniversaries. Woe befall anyone who forgets by birthday..LOL! Sending lots of good luck and wishes your way for many such stunning posts. This looks absolutely perfect and delicious! Molten cake is usually one of my most favorite desserts, especially because many times I can find a gluten-free version. This looks heavenly. Beautiful pictures. I remember the first time i made these, i kept overbaking them in the beginning , lol, so they were gooey inthe middle but not melty. Yours look perfect! i absolutely adore your blog ! will check it out more soon !! Beautiful dessert, hope you had a great Valentine's day celebration! 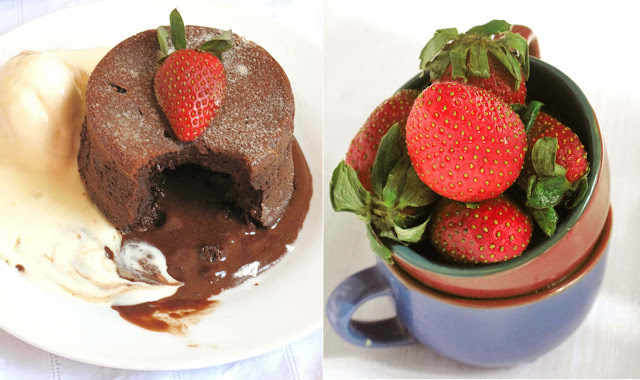 This is just so gorgeous Kulsum, i have being eyeing the molten cakes for a while now i HAVE to make them pretty soon! darling you are already pro with white background :) Stunning! and that whole room in the spoon is ha ha ha ha :D you are funny girl! Loving ur blog and am happy to find u... these cakes sure are gooey and delicous! Wow, it looks amazing, just came across your blog, love it, and love that picture of the spoon - fantastic!!! why is my lava cake not perfect.i baked at 170c for 12 minutes but it became dry as my oven has settings 150c 170c, 200c settings kindly help.